Welcome to 46 Prospect Point Loop, where the creek is in the back yard the beach just beyond the front. The homes features include: Only 250 yards from the ocean, finger creek on Prospect Cove, boat dock and ramp, 5 bedrooms, 4 1/2 baths, approx 4,950 heated square feet, 3 large living areas, elevator, beautiful live oak trees, long wide circular drive way with brick edging, Hardi Plank siding, Handmade French shutters overlooking creek, spacious upper level living room with gas fireplace, formal dining room with adjoining deck, Wet bar with icemaker, Ceiling fans, Office with built-in desk and cabinets, Beautiful Plantation shutters French shutters, newer roof and gutters, Lovely double entrance doors with glass, Large long Creek Room capturing full views of creek, Large piazza with covered roof overlooking creek, Gourmet family kitchen, Dacor double ovens and gas cooktop, granite countertops, butcher block island, and storage shelves, , Desk in kitchen, Tinted windows in Creek Room, LR, DR, and Master Bedroom, Wiring by Custom Theatre and Audio for Sonos sound system, wi-fi and tv's throughout home, Large lower level family room with gas fireplace and 50 television, tiled patio off family room, Deep 3-car garage with GarageTek flooring, cabinets for storage, Beautifully landscaped rear gardens with fencing designed and installed by Miller Iron, Pergola with fan and fountain on rear lawn designer walkways, Irrigation system, 2 outdoor showers, fish sink, Storage fro beach items, Hot tub/spa under house, Ideal home for either large or small casual or formal.. The Square footage is approximate. Buyer is responsible for verification. 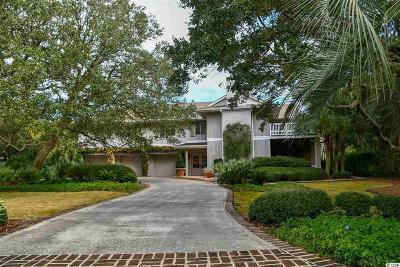 DeBordieu Colony is an oceanfront community located just south of Pawleys Island, South Carolina featuring private golf and tennis, saltwater creek access to the ocean, a manned security gate, and luxury homes and villas surrounded by hundreds of acres of wildlife and nature preserves. Directions: Debordieu Is About 5 Miles South Of Pawleys Island On The Left Of Hwy. 17. The Real Estate Office Is The First Building You Come To On The Left, Before The Security Gate. Park Your Car, Come On In, And We’ll Roll Out The Red Carpet For You!